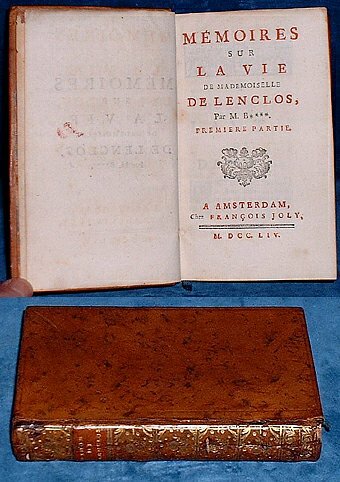 Title: MEMOIRES SUR LA VIE DE MADEMOISELLE DE LENCLOS par M.B. Description: Amsterdam, Joly 1754 . 3 Parts in One duodecimo marbled calf spine extra gilt with gilt lettered spine label (some worm damage to spine but covers well attached) All Edges Rouged half title, TP in red & black viii+120+viii 120pp 128pp in this edition the 2nd and 3rd titlepages seem not to be called for as the catchword for the next part occurs at the end of the previous part. Slight foxing but a neat tight copy of these letters of the courtesan to the Marquis de Sevigne, one of her lovers. *Most if not all these letters are spurious fabrications.